Founded in 2010 by dedicated Reclink Australia supporters Nick and Virginia Cable, The Great Peninsula Paddle is an iconic annual paddle event held on Victoria’s beautiful Mornington Peninsula. Celebrating its 5th Anniversary on Sunday 9th February, The Great Peninsula Paddle allows participants the opportunity to paddle along the stunning Mornington Peninsula shoreline from Sorrento to Portsea, gaining an exclusive paddler’s perspective of the Peninsula’s clear blue waters and white sandy beaches. Designed for the novice paddler, hobbyist or families, the short course is a leisurely 3.6km paddle from the Sorrento pier to Portsea with the finishing line located on the Portsea beach, just down from the iconic Portsea Hotel. Why not come down, support a good cause and enjoy the paddle! Reclink Australia is a non profit organisation whose mission is to provide and promote sport and art programs for people experiencing disadvantage. Established in Victoria in 1990, Reclink Australia operates nationally providing over 4500 activities and 80,000 participation opportunities for disadvantaged Australians annually. For more information, see the great national paddle page on Everyday Hero. Stayed at #HavanaInRye already? Come get your free stuff! One free night accommodation during your next stay. Like & share us at Havana in Rye on Facebook and follow us at @HavanaInRye on Twitter and get another free night! Refer a friend who stays with us and get yet another free night!! That’s right, you could get up to 3 free nights on your next stay!! Haven’t stayed with us yet? Well that’s no problem – this is a standing offer, which means once you do stay you are then eligible for the same free nights offers on your next stay. Awesome !! So what are you waiting for? The weather’s beautiful, the local beaches are fantastic and Havana is calling your name! We’re now on Google+ so why not add #HavanaInRye to your circle! Yes, we’ve finally jumped on to Google+ now as well! Come hang out with us, add us to your circle and share with your friends!! Come stay with us at #HavanaInRye in February and check out the final day of the Herald Sun Tour! The 2014 Herald Sun tour – now in its 61st edition – is Australia’s oldest stage bicycle race. It is one of Australia’s heritage sporting events, supported and revered by generations of Victorians and created by Australia’s largest daily newspaper, the Herald Sun. Riders from around the world compete in the Tour, with a long distinguished list of past winners. With the tour finishing up with Stage 4 on Sunday February 9, Arthurs Seat and the Mornington Peninsula is building as one of the most exciting days on the Australian cycling calendar. With three tough climbs featured in the 120km final stage route for 2014, the action is sure to be hot roadside for a fan favourite day on the hill at Arthurs Seat. Not to mention the many other attractions that the Mornington Peninsula has to offer such as wineries, gourmet eateries, family attractions, national parks, historic locations and beautiful beaches. Come stay with us down at Havana in Rye and make the most of the weekend. Based in Rye you will be conveniently located for the short drive to Arthurs seat on Sunday, as well as having quick and easy access to the Rye beaches and the well frequented coastal towns of Sorrento and Portsea. Come join us and take in all that the Mornington Peninsula has to offer! For more information on the 2014 Herald Sun Tour, check out the official web page. Come stay with us this long weekend and get 2 FREE NIGHTS! Mention this post or tweet to qualify when you book and either stay and pay for 3 nights instead of 5, or pay for 3 and stay on for an extra 2 nights free! Don’t forget to check out our post on everything that’s on over this long weekend as well! Come and add your comments to our other guests after a relaxing stay down the peninsula at Havana in Rye ! Come stay with us and enjoy the beautiful surrounds of Rye! Come and enjoy Australia Day at #HavanaInRye ! Australia Day is always a great day of celebration and family fun, and no doubt 2014 will be no different! Make the most of it by coming down to Rye and staying with us during the week and over the long weekend. And particularly, don’t forget the FIREWORKS DISPLAY in Rye from 9.15pm ! For more information on what’s happening on Australia Day, check out the Peninsula Australia Day web page! 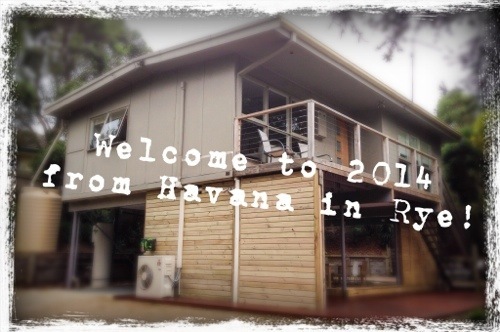 Welcome to 2014 from #HavanaInRye !